I wanted to put out some preliminary thoughts on current news – the assassination of former (and likely future) Pakistani Prime Minister Benazir Bhutto – but to do this, I will neglect the sweeping, link-laden and highly sourced analyses that I try to provide. Instead, my thoughts will be in the ‘stream of consciousness’ style. It is a sad day for the global war on terror, and the American left, always anxious to lay blame, hasn’t yet solidified its talking points. Peter Beinart believes that the U.S. administration is somehow to blame because we didn’t push President Pervez Musharraf far and fast enough towards democracy. Alan Colmes believes that the U.S. administration is somehow to blame because we pushed democracy on a country not ready for it. Presidential candidate Mike Huckabee inexplicably apologized for the incident, expressing “our sincere concern and apologies for what has happened in Pakistan.” Inexplicably, that is, unless along with the American left he also feels that the U.S. is somehow to blame for Islamic militancy in Pakistan. I won’t engage in the omniscient blame game. But Ambassador Bolton’s concerns are salient when he takes the position that in encouraging Bhutto’s re-emergence on the political scene in Pakistan we “helped to precipitate” the unfortunate events of today, and further remarks that of utmost strategic interest is the safety of the nuclear weapons under Pakistan’s care. Bolton fails to see how any of this helps the strategic interests of the U.S.
Bolton is not part of the political left, and while I usually agree with him, I take issue with his characterization of these events. I too, am concerned about the strategic interests of the U.S., and more could have been done after the first assassination attempt on Bhutto’s life (the first day that she returned to Pakistan) to protect her and provide more security. Bhutto is said to have desired and requested this additional security (and in fact from the U.S. FBI and other assets), and Pakistan is said to have denied this request. If this fact had been known, then the U.S. administration shares a little of the blame for not pushing hard enough on Musharraf for this protection (and of course, Musharraf is primarily to blame). However, Bolton is ignoring the long term strategic interests in having Bhutto involved in Pakistani politics. I have said before that “counterinsurgency in Pakistan begins in Afghanistan and along the Pakistan / Afghanistan border. Unless and until we devote the troops and effect the force projection to let the people in these AOs know that we are serious about the campaign, there will be no success.” I have advocated more troops in the Afghanistan campaign for the simple reason that not only must we win in Afghanistan, we have an unmitigated opportunity to kill Taliban and al Qaeda fighters in Afghanistan where we are not dealing with issues of sovereignty of Pakistan. In other words, we have the best of all possible worlds in the current campaign in Afghanistan (similar to the campaign in Iraq, although this is waning somewhat due to Iraqi sovereignty). We can fight international jihadists with the full approval of the administration and for the most part without the overhead of issues of national sovereignty. While Secretary of Defense Robert Gates is said to favor an addition of only 7500 troops to the Afghanistan campaign, hope springs eternal that strategic interests would be seriously evaluated around the globe (e.g., Germany and South Korea) and troop realignments would occur to support both the Iraq and Afghanistan counterinsurgency campaigns. We must think long term, and Bhutto, because she was a clear thinker, was a long term ally of the United States. It is a sad day for the U.S. and the global war on terror. Only time will tell how serious this setback is. My sense is that it’s very serious. The Telegraph is reporting that there are ongoing secret negotiations between British intelligence and the Taliban. Agents from MI6 entered secret talks with Taliban leaders despite Gordon Brown’s pledge that Britain would not negotiate with terrorists, The Daily Telegraph can disclose. Officers from the Secret Intelligence Service staged discussions, known as “jirgas”, with senior insurgents on several occasions over the summer. Opposition leaders said that Mr Brown had “some explaining to do”. The Government was apparently prepared to admit that the talks had taken place but Gordon Brown was thought to have “bottled out” just before Prime Minister’s Questions on Dec 12, when he made his denial instead. This is further confirmation, but to be precise, this is not news. We have previously discussed the fact that British officials believed the Taliban to be too deeply rooted to be eradicated by military means, and had intended to court the alleged more “moderate” members of the Taliban to attempt to divide their organization. We have also discussed the fact that Britain does support negotiations with the Taliban and sees a role for them to play in the new Afghanistan. Brown is referring to an effort underway by Hamid Karzai to obtain the loyalties of the lieutenants of Mullah Omar and thus split the organization. The price for this loyalty is a place at the table in the new Afghanistan. So Prime Minister Brown will likely continue to play politics before the House of Commons and explain that Britain really doesn’t negotiate with the Taliban, but supports settling with the more ‘moderate’ Lieutenants of the senior leadership in order to fragment the Taliban. He is taking this position because not a single country currently engaged in Afghanistan is willing to send more troops into the theater except the U.S., and Gates himself is only willing to commit an additional 7500 troops despite the ongoing review of the Afghanistan counterinsurgency campaign. The British position is based on the American experience in Anbar of co-opting the enemy, or settling with erstwhile insurgents with the concerned citizens program. Or so they think. Sadly, this is to mistake the Anbar narrative. In Anbar, the U.S. Marines gave the U.S. the upper hand from three hard years of kinetic operations, and negotiations with the tribes took place from the perspective of strength. Further, the Anbari tribes were not, for the most part, fighting from a perspective of religious fervor. It is one thing to settle with insurgents who need jobs to feed their families. It is quite another to settle with men who desire your death because of religious beliefs – like the Taliban. The Brits are involved in a dirty game, indeed. 12/26/2007 – SOUTHWEST ASIA (AFPN) — Coalition airpower integrated with coalition ground forces in Iraq and the International Security Assistance Force in Afghanistan during operations Dec. 25, according to Combined Air and Space Operations Center officials here. In Afghanistan, an Air Force F-15E Strike Eagle performed a show of force with flares to deter enemy activities in Gereshk. The mission was reported as successful by an on-scene joint terminal attack controller. F-15Es performed multiple shows of force in Kandahar and a show of force in Kajaki Dam. The shows of force, including the use of flares, were performed to deter enemy actions. All of the missions were reported as a success by a JTAC. 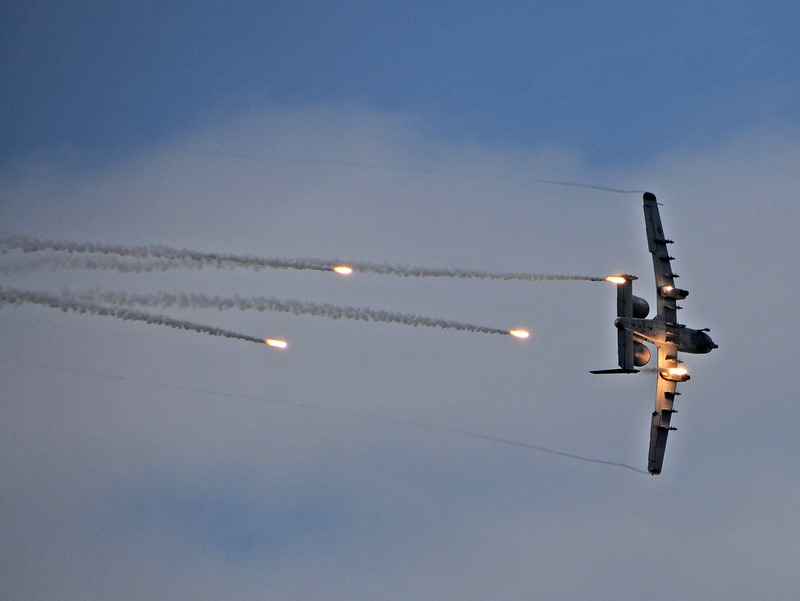 Air Force A-10 Thunderbolt IIs conducted shows of force with flares to deter enemy activities in Orgune. The shows of force were reported as successful by a JTAC. In Khowst and Kajaki Dam, multiple shows of force were performed by F-15Es to deter enemy activities in the area. JTACs reported the missions achieved the desired effects. In total, 39 close-air-support missions were flown in support of the ISAF and Afghan security forces, reconstruction activities and route patrols. In Review and Analysis of Afghanistan Counterinsurgency Campaign, we noted that the first quarter of 2008 should see the results of a department-wide review of the Afghanistan COIN campaign strategy, and previously we have strongly suggested the needs for more troops. Secretary of Defense Robert Gates sets the pretext for this review and essentially tells us what he expects to see as a result of the review. Gates said a small number of additional troops are needed in Afghanistan, but ruled out a broad surge of American forces. Commanders in Afghanistan are asking for smaller numbers of combat troops and support personnel who could train Afghan forces, but do not see the need for an Iraq-style troop buildup. Those additional 7,500 troops could be drawn from American forces. Gates had been pressing the NATO allies for more troops. Though U.S. officials do want to maintain pressure on allied nations to send more troops, Gates noted there is little reason to press countries with a weak minority government for whom it is politically impossible to send more troops. “Continuing to publicly go after our allies for things — to do things that politically are just impossible for them is probably not very productive,” he said. Gates said the challenge of the year ahead in Afghanistan is to build on military progress, maintain control of newly recaptured areas and start to push ahead on some economic progress. This seems overly optimistic to me, and 7500 additional troops still doesn’t provide either the ability to conduct operations in a country the size of Afghanistan or to supply border security. The role of Syria – at least tacitly – in the suicide bombings in Iraq and other foreign terrorist activities is well known. Yet only recently is the United States diplomatic corps said to have lost patience with Syria. Despite reports to the contrary, Iran continues to fund, arm, train and supply terrorists in Iraq in an effort to destabilize the country. The foreign origins of the violence in Iraq could have been (and could be) better addressed than it has been. The EFP (explosively formed projectile) factories in Iran should have been enemy targets as much as insurgent domiciles, and the Syrian Imams who recruited and supplied suicide bombers into Iraq should have been considered enemy fighters as much as those holding a weapon in Fallujah or Baghdad. While the U.S. has conducted robust kinetic operations against the foreign fighters in Iraq with huge success, the strategy could still have been completed with so-called black operations against rogue elements in Syria and more visible operations against EFP factories in Iran (or at least diplomatic pressure against Iran, something the State Department seems loath to do). However, in the area of the indigenous insurgents, the U.S. strategy has been more lucid. The goal in counterinsurgency is to disrupt the allegiance of the people to the insurgents and then to ameliorate the conditions that led to the insurgency. Kinetic operations against foreign fighters were necessary because they fight mainly due to religious motivation. However, for the indigenous fighters, for months we have advocated both settling with the erstwhile insurgents and payment to the concerned citizens as both effective and anthropologically sound. It has become in vogue, especially among the political left, to level very specific criticisms at this approach. Kevin Drum gives us the template for this strategy bashing. I’ve mentioned a few times before that our “bottoms up” strategy of supporting Sunni tribes in the provinces surrounding Baghdad carries a number of risks. The biggest risk, I suppose, is that once the tribes finally feel safe from the threat of al-Qaeda in Iraq, they’ll relaunch their insurgency and start shooting at American soldiers again. The second biggest risk is that the Shiite central government understands perfectly well that “competing armed interest groups” in the provinces are — well, competing armed interest groups. Iraq’s Shiite-led government declared Saturday that after restive areas are calmed it will disband Sunni groups battling Islamic extremists because it does not want them to become a separate military force. ….The statement from Defense Minister Abdul-Qadir al-Obaidi was the government’s most explicit declaration yet of its intent to eventually dismantle the groups backed and funded by the United States as a vital tool for reducing violence. “We completely, absolutely reject the [Sunni] Awakening becoming a third military organization,” al-Obaidi said at a news conference. He added that the groups would also not be allowed to have any infrastructure, such as a headquarters building, that would give them long-term legitimacy. “We absolutely reject that,” al-Obaidi said. The Maliki government has made similar noises in the past, but this is by far the most unequivocal they’ve ever been about it. And needless to say, the Sunni leaders are having none of it. There’s exactly zero chance that they will ever voluntarily disband their “Concerned Local Citizens” groups. Who knows? Maybe this is posturing more than anything else. Maybe Petraeus and Crocker can work some magic that will defuse all this. But a year from now, if the Iraqi civil war is raging once again, this is where it will have started. UPDATE: In the New York Times, Alissa Rubin and Damien Cave have a long overview piece on the current status of the Awakening. Money quote: “The Americans are haunted by the possibility that Iraq could go the way of Afghanistan, where Americans initially bought the loyalty of tribal leaders only to have some of them gravitate back to the Taliban when the money stopped.” The whole thing is worth a read. Surely, with the Sunni leaders warning against sidelining the auxiliary police and concerned citizens, the Maliki administration should listen carefully. Furthermore, Major General Rick Lynch has been clear on U.S. expectations for the administration. A top U.S. commander warned that Sunnis who fight al-Qaida in Iraq must be rewarded and recognized as legitimate members of Iraqi society – or else the hard-fought security gains of the past six months could be lost. The people say security is good now, but we need jobs. It’s all about jobs and we have to create them,» he told The Associated Press as he flew into patrol base Salie, just south of Baghdad – where U.S. troops fund about 150 members of the tribal groups. We are in a tenuous situation. We need to give jobs to the citizens (groups) or they will go back to fighting. The U.S. military now funds the groups, known as Awakening Councils, Concerned Citizens and other names. But these Sunni groups expect to be rewarded for their efforts with jobs, either in the Iraqi security forces or elsewhere. Rather than an observation of the necessity for political progress, this statement follows the template of criticism set out by the left, and it has been followed with religious fervor. Note carefully what Drum charges. Rather than the seeds of violence being one thousand years of religious bigotry between Shi’a and Sunni, or recent history under Saddam’s rule, or the temptations of oil revenue in a land that has not ever seen the largesse of its natural resources due to corruption, the cause is said to be the “concerned local citizens” groups, i.e., U.S. strategy. This outlandish claim betrays the presuppositions behind it – specifically, that it would be somehow better to continue the fighting than to, as they charge, buy peace with money. But for the hundreds of thousands of disaffected Sunni workers who have no means to support their families, this criticism is impotent and offers no alternative to working for the insurgency to feed their children. It ignores basic daily needs, and thus is a barren and unworkable view when considering the human condition. The strategy all along has been one of ground-up counterinsurgency. The statements by military leadership in Iraq, far from hiding the fact that political progress must follow on the heels of military progress, show not only a knowledge of this fact, but demonstrate that it is this way by design. The intent from the beginning has been one of providing the window of opportunity for political reconciliation, at least insofar as the provision of basic human needs is concerned. In this way, command in Iraq has attacked the enemy’s strategy, and has done so with remarkable success. To the chattering class, success of the preparatory stages (the counterinsurgency proper), doesn’t provide a reason to hail the successes of the campaign. Rather, it provides a reason to level the a priori charge that we caused a civil war, if in fact one ensues. To the more sensible thinker, it should remind us of the fact that we are not finished, and more work needs to be done to complete the campaign. The Holidays are certainly a time to remember those who serve us, especially those in the way of harm. It is quite appropriate for a Military blog to convey love, deep gratitude and sincere appreciation for the hard service of being in combat in Iraq and Afghanistan any time, but so much more during the holiday season. This is an especially hard time for the troops who wish more than anything else to be with loved ones. But the purest love is given to us by God in His son, Jesus Christ, the Word incarnate, and this is what we celebrate during the Christmas season. When so many are confused about what true religion means, it should be remembered that the message is not that mankind needs the perfect example, although the life of Christ was perfect. Rather, it is that mankind needs a savior, and this was the reason He came to earth. ” … and she will bear a Son, and you shall call His name Jesus, for it is He who will save His people from their sins … Behold, the virgin shall be with child, and shall bear a Son, and they shall call His name Immanuel, which translated means, ‘God with us’.” Matthew 1:21-23. I wish all of my readers a very merry Christmas this holiday season, and leave you with a video of beautiful music. May you be joyful and with family. The health affects of pet ownership have long been known, from reduced blood pressure to higher survival rate after serious illnesses. Dogs have been used in wars before, but a new emphasis in the utilization of dogs by the Department of Defense has become apparent, and it’s about time. Dogs will soon be providing therapy to soldiers in Iraq. Sgts. First Class Budge and Boe are headed to Iraq. Budge and Boe don’t have last names: They’re dogs. But the pups are now officially enlisted as the Army’s first therapy dogs for soldiers in combat. The two black Labrador retrievers will be stationed with the Army’s combat stress units in Tikrit and Mosul. Their role? To help soldiers deal with the stress of fighting overseas. On Sunday, two (human) sergeants from the 85th Medical Detachment flew to Long Island to meet the two dogs at the Guide Dog Foundation for the Blind in Smithtown, which trained Budge and Boe. And the dogs won’t just be playmates for the troops, said Sgt. Jack Greene, another occupational therapist who will take Budge back with him to Mosul. “The major thing is, they are going to help us knock down the stigma around mental health,” he said. But before heading off to Iraq, the dogs needed to get used to sights and sounds similar to those they will encounter in Iraq. This week, the soldiers, the dogs and foundation officials visited the shooting range at Brookhaven National Laboratory, where the dogs were exposed to the sounds of submachine guns and handguns. The dogs went to Long Island MacArthur Airport, standing by as Suffolk County police hovered in a helicopter, the wind whipping at the dogs’ fur. And the dogs braved perhaps one of the toughest tests of all: a jaunt through Smithhaven Mall during holiday season, designed to test their reaction to the chaos of crowds. The dogs have been in training for months, and each has learned simple tricks as well as how to respond to voice commands such as sit, stay and play. Now Budge and Boe must bond with Calaway and Greene, their handlers until the spring, when the men are scheduled to return from Iraq. Then, Maj. Arthur Yeager, an occupational therapist based at Walter Reed Army Medical Center, takes over. Yeager, who is to deploy to Iraq next year, said therapy dogs are used at Walter Reed to help soldiers deal with treatment and recovery. He said he expects it to work on the battlefield as well. Soldiers in Iraq visit the combat stress unit when they become overwhelmed with the rigors of battle or by problems their families face at home. But not every soldier welcomes the idea of going to the unit. Some have difficulty asking for help with stress, Yeager said. That’s where Budge and Boe come in. “To have a dog come up and nudge your hand — I have yet to see even the hardest soldier refuse that,” Yeager said. The sergeants and dogs plan to leave Long Island on Saturday for Fort Hood, Texas, where the 85th Medical Detachment is stationed. There, Budge and Boe will be examined by a veterinarian for medical issues before deploying to Iraq. Boe and Budge also will be given the new rank of sergeant first class. No one has to salute them, though. The rank is set higher than that of their human handlers to prevent possible abuse of the dogs, because the Army looks severely at any service member who abuses a higher-up. Mike Sergeant, chief training officer with the foundation and a Vietnam-era veteran, said the Army’s program is a good step toward meeting the mental health needs of its soldiers. “Dogs are not going to be the sole answer, but they certainly will be an icebreaker,” he said. 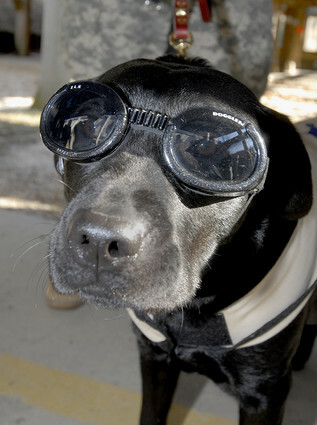 There are still further uses for dogs, helping not warriors, but bringing closure to the families of fallen warriors. Lex attended the funeral of his best friend in March, playing with the 20-year-old Marine’s younger brother away from the crowd. He was beside Cpl. Dustin Lee when Lee was killed in a mortar attack in Falluja. Wounded himself, Lex didn’t want to leave Lee’s side after the attack — fellow Marines had to pull him away from the young man’s body so medics could do their work. Although some shrapnel remains in his body, Lex recovered from his wounds and returned to duty at the Marines’ Logistics Base in Albany, Georgia, to await a new assignment. On Friday, Lex gets that new assignment — retirement to Lee’s family home in Quitman, Mississippi, where the 8-year-old bomb-sniffing German Shepherd will live out the rest of his life. One of the issues was making sure the dog was not “overly aggressive.” His behavior with the Lee youngsters — Lex played tug-o-war with 13-year-old Camryn at Dustin’s funeral — seemed to assure that wouldn’t be a problem. Marine officials also said the request had to go through the Air Force, which is the approving authority for all military dogs. Finally, on December 13, the Marines agreed to let Lex live with Lee’s family. It was the first time the Marines have released a dog before its retirement to a former handler’s family. Well before joining the Marines, Dustin Lee was known by all for his devotion to his country. A member of Quitman High School’s cross-country track team, Lee and three teammates participated in the Americans United: Flag Across America Run after the September 11, 2001, terror attacks on New York and Washington. So it was no surprise when the young man joined the Marines out of high school in 2004, nor was it a surprise when he went to Albany to train military police dogs, inspired by his mother’s work with the county’s search and rescue team dogs when he was a boy. Dustin, an animal lover who also rode horses, played hide and seek with his mother’s canine companion as a child, Jerome Lee said. “He would let the dog get a sniff of his clothing and then go hide to see if the dog could find him,” the elder Lee said. Dustin and Lex had been stationed in Falluja for nearly five months before the fatal attack. When the Marine’s body was returned to Quitman in late March, hundreds lined the streets waving American flags to say a tearful goodbye. And Lex was there. In Albany on Thursday, current kennel master Mike Reynolds led Lex through his paces for the last time in his military career. Now it’s time for the old pro to learn some new civilian tricks. In a ceremony on Friday, Lex will join the family of his best friend. “There’s always going to be that missing link with Dusty gone,” he said. “But part of Dusty is here with Lex.”Lex attended the funeral of his best friend in March, playing with the 20-year-old Marine’s younger brother away from the crowd. He was beside Cpl. 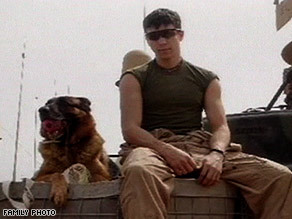 Dustin Lee when Lee was killed in a mortar attack in Falluja. See also Family Adopts Slain Son’s Military Dog, and U.S. Troops in Iraq to Get Some Doggie Love. With no apologies to cat lovers, “man’s best friend” is proving itself once again as good for the soul. It’s brief, but the USMC has released the first video of the V-22 Osprey in operation in Anbar. The context: The footage of the tiltrotors appeared briefly as part of a USMC news story focusing on preparations in Western Iraq for the Haj, an annual religious pilgrammage. The two MV-22s were filmed clearing a landing zone along the route. Colonel Daniel Roper from the Counterinsurgency Center at Fort Leavenworth was recently interviewed on the counterinsurgency campaign in Iraq and how tactics have evolved to address the insurgency. Largely lost in the surge that sent more troops to Iraq this year and that lengthened the deployments already there was that the U.S. military began to change how it fights. New doctrine drawn from mistakes made in this war and in battling previous insurgencies has called for less shooting, more talking, fewer bombs and more building (Editorial note: This description by the journalist is apt for the later stages of the campaign, but certainly not the first two and a half years of the Anbar campaign when Marines were involved in heavy combat, regardless of what the journalist or Colonel Roper might claim). That has been widely credited for helping ease violence in Iraq this year and shaping new alliances made in Iraqi communities to root out al-Qaida and other terror operations. Army Col. Daniel Roper is just back from three months in Iraq to take over as director of the Army/Marine Corps Counterinsurgency Center at Fort Leavenworth. Part of his job is to tweak the doctrine. Part is also to sell its principles to the military and to the American public. The colonel spoke with The Kansas City Star. The interview has been edited and condensed for brevity and clarity. Q: Has the relative success in Iraq, a less dangerous but still violent and volatile place, come from the new approach to counterinsurgency, or because of the surge? A: It’s both. To do counterinsurgency successfully requires resources. It means having boots on the ground. But then when you’re there, you need to do things the right way. Make connections. Build relationships. Earn trust with the population. Q: Do the vastly larger troop numbers in Iraq explain why the situation there has improved while security has deteriorated in Afghanistan? A: It’s the same principles. In Afghanistan it’s a lot about building roads, because that’s what they need so badly there. But there’s no secret that we’re looking to get additional help from other countries there. Editorial observation: It is not apparent whether Colonel Roper is saying that road construction can be a means to defeat the insurgency, but if so, I must disagree. Roads were not in place prior to the time at which the Taliban forcibly took authority over the government, and while we should support the construction of roads and other building projects as a means to bring trade and commerce and thereby undercut one motivator for recruitment for the insurgency, this should be seen as a means of amelioration and prevention, and certainly not a replacement for military tactics. Finally, the existence of roads doesn’t necessarily mean that they can be used for commerce. In Musa Qala: The Argument for Force Projection, we discussed a main road, Afghanistan’s Highway 1, that is dangerous enough that it is a deterrent to commerce. Q: Might that suggest that our troop shortage, and the move we’re seeing now to begin to roll back from the surge, could mean a loss of the gains that have been made? A: It’s patience. And that’s very hard. Do we want to sign up for something that’s going to last 10 years? Do we have a choice? There’s a risk that we lose some of our gains when brigades pull out. But in talking with commanders in Iraq no one suggested that they were unduly concerned that all would be lost. Q: How does mounting resentment toward the U.S. occupation in Iraq — four and a half years now — make it more difficult to win over ordinary Iraqis? A: In some cases it would be a problem. But we’re getting out with the people and getting away from being an occupying force. Just the right presence with just the right tactics, that’s how you actually win this fight. Unless you plan to colonize a place and stay forever, you cannot kill your way to success. The key is to isolate the insurgents from the population — both physically and psychologically. Q: Lt. Col. John Nagl, a key contributor to the new counterinsurgency doctrine, said recently that the military is not going far enough or fast enough to adapt to the threat of insurgencies. Does he have a point? A: You can make that case. We would all like it to move faster. There is a challenge for the guys on the ground. They have to adapt. This is not about how many people you can kill. It’s about how many connections you can make. The hardest part is organizational. There are limited resources in competition with the need to be able to fight a major conventional conflict. Q: In fact, some people suggest we might need two armies — one ready to take on the Koreans or the Chinese if the need arises, and one equipped for nuanced counterinsurgency. Is that right? A: Again, it’s a question of resources. That’s a decision for the Pentagon and a decision for the American people. What do you want the military to do? If being involved internationally means that you’re going to be dealing with insurgencies, then you make those choices. This answer by Colonel Roper seems to presume that if there is going to be an imperial function in U.S. armed forces, this function necessitates that there be a leviathan/sysadmin bifurcation. Whatever else one might think about this division, it is unrelated to the need for imperial troops, if such a function is deemed to be needful (The Marines have functioned in part as imperial troops in the more than 300 engagements since their birth on 10 November 1775. It should be pointed out that whatever one thinks of interventionism and nation building, there are unintended consequences to isolationism too, and these consequences are seldom thought about by isolationists. The assumption is usually made that proactive interventionism has only negative consequences, an obviously and demonstrably false assumption). At the Small Wars Journal Blog there is an article by the same subject title. This article is by Clint Watts and is another excellent warning to the Pentagon thinkers and planners. It is commended to the reader, and I supplied the following comment. It has become in vogue to characterize the Anbar narrative as the “awakening,” and nothing more than this, as if it was all about getting a tribe to “flip.” To be sure, we needed Captain Travis Patriquin’s observations sooner than we got them, and I have argued almost nonstop for greater language training before deployment and payment to so-called “concerned citizens” and other erstwhile insurgents. You can qualify expert on the rifle range, but if you can’t speak the language, you’re going in ‘blind’ (to play on words). But just to make it clear, to see the Anbar narrative as all about tribes “flipping” is an impoverished view of the campaign. It’s a Johnny-come-lately view. Hard and costly kinetic operations laid the groundwork for the tribal realignments. Sheikh Sattar had to have his smuggling lines cut and dismembered by specially assigned units conducting kinetic operations in order to ‘see the light’ and align with U.S. forces. Then, a tank had to be parked outside his residence to provide protection against the insurgents in order to keep him alive and aligned with the U.S.
To be sure, the tribal alliance is a large part of the Anbar victory, but force projection (not force protection) was the pretext for the Anbar awakening. We simply cannot do COIN on the cheap. I hope that no one exists who believes that we could have waltzed into Anbar three years ago, without the pretext of force projection, and sat down with the tribes and verbally persuaded them to join “the cause?” Perhaps we could have done it (won) sooner (perhaps two years), and perhaps we could have done it without quite the heavy losses (if we had been prepared for IEDs and snipers a little better), and perhaps it could have been more efficient had we understood the culture and language better. But make no mistake. The strong horse gets the bet. There is no value in weakness in this part of the world. And the Anbar campaign must not be seen as the consequent of any revised strategy or the surge. It did not result from any of this, but was ongoing for three years separate from what happened in the balance of Iraq. Export the strategy? Of course, but an understanding of the strategy is necessary in order to export it. SF operators and talk didn’t win Anbar. Force projection won Anbar. COIN in Pakistan begins in Afghanistan and along the Pakistan / Afghanistan border. Unless and until we devote the troops and effect the force projection to let the people in these AOs know that we are serious about the campaign, there will be no success. The troops needed to conduct COIN in this campaign are currently in Anbar, or at Camp’s LeJeune or Pendleton. Conclusion: This is a good article, and serves as yet another warning to the Pentagon thinkers and planners that there are no strings to pull, no buttons to push, and no magic words to speak. ‘Abracadabra’ plus the right formula just doesn’t work, and leaves us where we were before. COIN requires boots on the ground. How many more warnings will have to be issued? Force projection + COIN = A winning strategy.